In June 2017, the Exapro team participated at the Fitmaq – International Fair for Used Machinery, taking place in Bilbao, Spain. That was a great opportunity to meet the best suppliers of used and bargain machinery face-to-face. Exapro COO, Maxime Gardie, participated in a two-day event, representing the Exapro team of sales managers. Maxime prepared the following report about Fitmaq to update our partners on what’s good and new. Exapro’s mission on a trade fair is usually to meet partners we are working with and potential new partners who could be interested in publishing their offers on Exapro. We don’t go to trade fairs to sell anything as we have our online catalog – the most effective selling tool. The mission at Fitmaq was to meet partners. Although the trade fair was quite small compared to other trade fairs we’ve visited in the past, it was for me a good opportunity to meet some Spanish partners I’ve been working with for a few years now for the first time. I met about 7-8 partners and 4-5 potential new partners, so hopefully meeting all of them will improve the way we work together and will help us sell more machines together soon. It is usually a good way to improve a partnership. There were not many new partners there that we wouldn’t know at all. Most companies who were attending Fitmaq and who are not working with us had already a client account at Exapro so they obviously knew us but still hadn’t actively worked with us. So my first question was to know whether they created an account just because they were looking for machines or if they could also be interested in publishing their offers on our website. Most of those companies replied they have nothing against it and if they haven’t published anything yet it is mainly because of lack of time rather than because they wouldn’t want to work with us as sellers. So we agreed we will add machines for them and this way they can start advertising their machines. As I said earlier the Fitmaq trade fair was rather a small one in the end. It exists for 3 years only and there is another bigger trade fair in Bilbao next year so that might explain the matter of things. 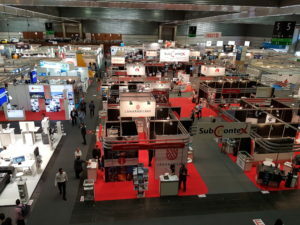 The feeling I also received from the exhibitors I met there is that out of 3 days, the first and the third days were quite calm so they didn’t have any intense activity and will probably think twice before the become exhibitors again during next trade fair in 2 years. For me, this trade fair was successful because here again, I didn’t go to sell anything but to meet partners and I met some very good partners and most of them have already sold with us, not much, but a few good deals so they were generally happy with our services. We could talk together and see how we could improve the way we work. 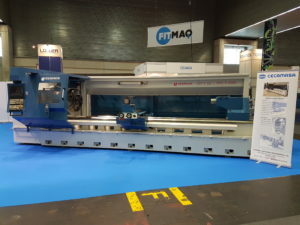 Hopefully, it was productive and we will manage to sell more machines very soon with those reliable Spanish partners. We don’t have any plan at the moment to attend any other specific trade fair but there are many others in France, Germany, Italy, UK or Poland which could be interesting. It will depend if any agent working on those markets finds any interest in visiting those trade fairs and if there are any good partners or good potential new partners there. We also don’t often get to see the machines we sell for real so it is also a good experience to understand better the products we advertise. My general feeling about Fitmaq was very positive.